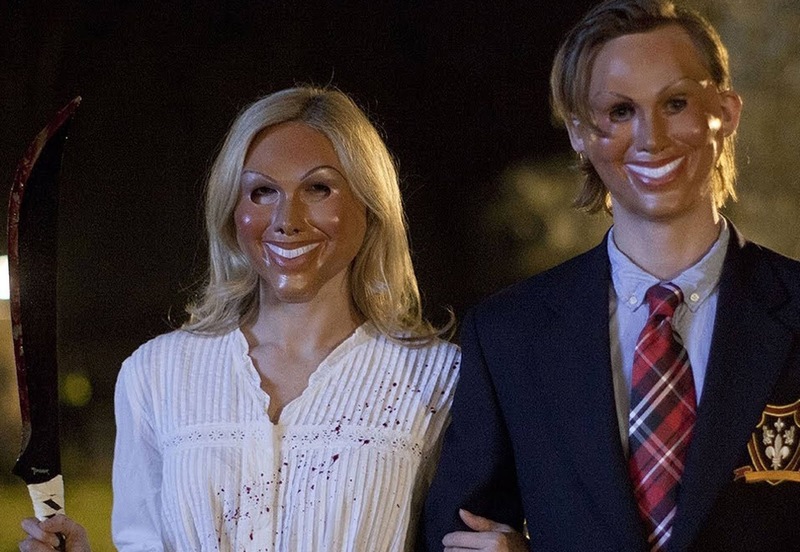 The Purge is a rare film by mainstream Hollywood standards - one which is both morally ambiguous and one which also leaves the viewer with more questions unanswered than the neat, tidy, nonthreatening ideologies which are usually pre-packaged for our consumption. It's a challenging take on the home invasion thriller and, had it been directed by David Fincher for example, would have been given a much kinder critical reception for it's genuinely tense genre stylings and troubling social allegories. The premise of James DeMonaco's movie is succinct to a winning degree - one night per year, all crime is legal. Instantly this opens up a number of questions - what IS society without law? Without rules and social contracts to bind us, what does human nature look like? What would you do if you could act without restrictions, or fear of retribution, for a limited time? America of the near future, a "nation reborn", is living with the consequences of the rules set down by the New Founding Fathers which allows for chaos and anarchy to reign for a one night window per year. Strangely, the mass of American people find these new rulings cathartic - they bottle up all rage and frustration with their jobs, their social standings, and release it all in one explosive blast of orgiastic violence on one sad, brutal evening per year. The victims, of course, are the most vulnerable in society, giving The Purge a satirical take on class entitlement. The poor bear the brunt of this new governmental policy, left on the streets to fend for themselves, whilst the rich can horde themselves away in their protected and enforced homes, waiting for the horror to pass. It's a faint echo of governmental initiatives like the Iraq war which saw scores of America's least privileged young men return home in flag draped coffins whilst the upper echelons of society, those who gave the decree to fight, sit back protected from the atrocities they masterminded. The action here is centred around one of the families who gained most from the New Founding Fathers' laws. Whereas the military/industrial complex has made war a very profitable notion for a few, The Purge has likewise become a great revenue stream for those who are willing to commercially exploit it. Step forward James Sandin (Ethan Hawke) who has made his family very wealthy from selling security measures to his wealthy neighbours - it's this money which allows the Sandins to hole themselves up each year in a heavily protected building and wait for the night to end. What happens, however, if the security is breached or, perhaps, its not as good as the sales spiel on which their success is founded? As The Purge takes place, its inevitable that the Sandins house becomes invaded and, indeed, with alien elements wandering through their home, attention is attracted from throughout the neighbourhood. How will the Sandins' neighbours react when they realised that the equilibrium of purge night has been thrown askew? And is class conflict perhaps more subtle than "rich versus poor"? Festering resentments which can be buried behind polite smiles and manners for the rest of the year can erupt when there's no social reason for them to be hidden. At 85 minutes long, The Purge is by no means a comprehensive exploration of class and society and indeed it's not always the most sophisticated of movies; it is at heart, after all, a popcorn thriller with jolts of the body sought after on a more regular basis that jolts of the mind. Yet, at the same time, there's much more to contend with by the time the credits roll than the average thriller would provoke and the fact that there's much more to explore here (about the macro, rather than micro, ramifications of the night) opens up the possibilities of a welcome new franchise. Thanks for your review of this Kieron; I saw an advert while out in town and being a fan of the horror genre, was wondering what it was all about. The Purge sounds really, really interesting - it sounds like in the real world it could have been one of those highly telling psychological experiments! Aye - it was the advertising I saw on a phone booth that got me really interested in this. I thought it was an interesting premise and wanted to see the iflm regardless of its quality to see how it would execute this - i'd say it did so admirably.